Located in the southeastern part of the Caribbean Sea, Saint Lucia is a small island country that is part of the Lesser Antilles. A favorite stop for cruise ships, the island offers visitors innumerable opportunities for adventure and exploration, from tropical rainforests and breathtaking waterfalls to ancient ruins and extraordinary botanical gardens. For those wanting to make a stop at a smaller, less populated region during a Caribbean cruise, Saint Lucia is the perfect choice. 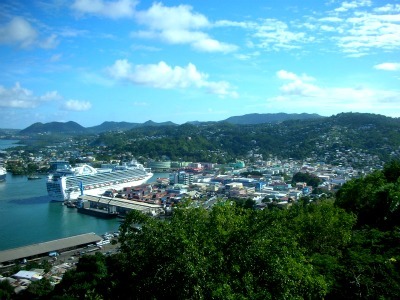 Cruise ships arrive in the main harbor of Castries, the largest community and capital city of Saint Lucia. The vessels dock at Place Carenage or nearby Pointe Seraphine, both of which are part of the main waterfront area of the city. The docks are within easy walking distance to the central business district and there are both taxis and public transportation available at either location. Duty-free shops for souvenirs can be found near both of the anchorage points and there are a number of visitor-friendly trinket stores in and around the waterfront area and on the main streets of town. Castries itself is certainly worth a detailed walking tour, but the main attraction in Saint Lucia is the natural beauty of the island itself. Getting out of town and seeing the magnificent rain forests is a popular excursion for most cruise tourists. 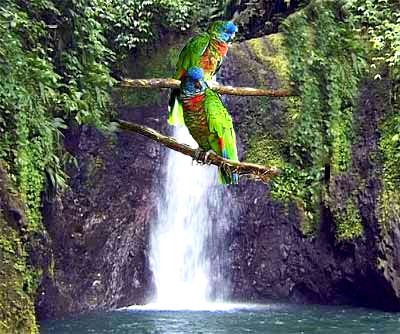 Much of the island is protected as a natural preserve, with the Saint Lucia National Rain Forest covering a good deal of the total land area. Hiking trails are abundant and visitors will find no shortage of vantage points for taking memorable photos. Somewhat more mountainous than many other Caribbean islands, Saint Lucia's most famous natural landmark is the Twin Pitons, a double peak located in the southern part of the island, while the nearby Soufriere Drive-In Volcano attracts thousands annually to its active sulfur pools. The Diamond Botanical Gardens and Waterfall is one of the loveliest collections of floral species in the West Indies and also contains mineral baths near the waterfall. Pigeon Island, located at the northwest end of Saint Lucia, is a great place for families to spend an afternoon. Here visitors find a complete interpretive center that details the island's history, excellent walking trails that offer views of the sea and mainland, and plenty of ruins to explore, most of them part of the forts originally erected as separate factions fought for control of the island in its colonial days. Horseback riding, snorkeling and even helicopter tours are also popular activities for those arriving on cruise ships to Saint Lucia. Fresh seafood dominates the menu at most of the fine restaurants on Saint Lucia, especially in the capital city of Castries. A good choice for lunch would be The Charthouse, which overlooks Rodney Bay not far from the docks and offering up an excellent combination of steaks, seafood and salads. The Green Parrot, located on Morne Fortune directly above Castries Harbor is a great place for both lunch and dinner and has a widely diverse menu that includes Creole favorites, West Indian originals and many international delights. At the Ladera Resort in Soufriere one can enjoy the very best in Caribbean cuisine at the Dasheene Restaurant, where a delightful mix of authentic recipes awaits. This is considered by many the best seafood restaurant on the island and also has the best views of the town and waterfront. Visitors will also find a good selection of snacks at the many open air cafes near the cruise ship docks, where soups, salads and fresh fruits are always available. The cruise docks are adjacent to the center of Castries, but visitors will need to take a taxi, public bus or rental car to access the island's natural treasures. Taxi service is plentiful and there are a good number of public bus routes. Taxi prices can be negotiated with the vehicle operator. The bus lines do not run on a set schedule but wait at major stops until full. Also visitors cannot rent a car in Saint Lucia unless they either have an international permit or purchase a temporary one while on the island. English is the official language of the island. The monetary unit is the Eastern Caribbean Dollar, although U.S. Dollars are often accepted. The island has a good number of ATMs for currency exchange. If an international telephone call needs to be placed, most visitors will use the Internet cafe at the Caribbean Travel Agency on Micoud Street in Castries. 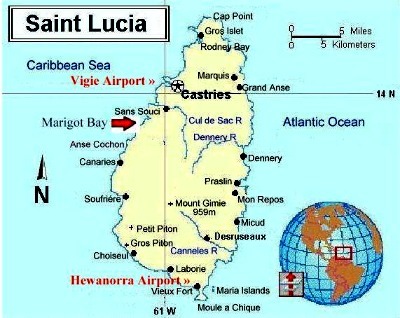 The map of Saint Lucia island. 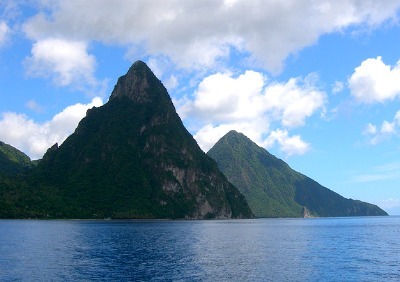 Here is a view of Twin Pitons, perhaps the most famous location on St. Lucia island. Castries, the capital of St. Lucia, from a hill-top. A scene of a waterfall in one of the lush rain forests of St. Lucia. 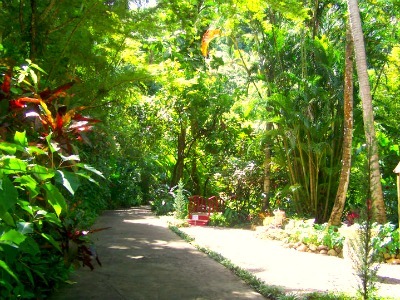 The Diamond Botanical Garden is a beautiful place to spend couple of hours.